REDUCED! DIRECT BEACHFRONT, Premier view location! RARELY AVAILABLE ...the PREMIER END location! Spacious 2BR with sweeping GULF views & sunsets in wonderful 4-star Disney-style family resort fronting on the renowned Ft. Myers Beach sugar sand beach. CONDO-HOTEL WITH FULL RENTAL MANAGEMENT MAKES OWNERSHIP VERY EASY! Interior Features Floor to ceiling windows capture a view that will take your breath away. Upscale finishes throughout and fully, very attractively furnished. 2BR, 2 bath end unit--premier location! Exterior Features A fabulous lagoon-style resort pool, exercise room, boating activities, fishing pier, business center, full service Spa, organized kid's activities make this a wonderful vacation home, plus a very attractive rental destination. Additional Features and Amenities Combine family vacations with strong rental income--very easy for an absentee owner. 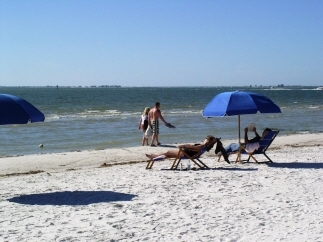 Pink Shell Resort is the most popular resort on Ft. Myers Beach located at the quiet end of the island but within walking distance of addl. restaurants, shops. $40,000 PRICE REDUCTION = tremendous buying opportunity!